My good friend Barb, from Bella Vista, is hosting a fun party in Blogland. She has invited us to show our roosters! You need to head over and check out her invitees and all their roosters! You might remember that I am not a collector or decorator of roosters. All I could do last year was this and this year, unfortunately, I won't do much better. I always have fun at Barb's so I just have to participate! This year I wanted to focus on a product that my ever lovin' Triplet sister Tammy introduced me to. It is called Rooster Sauce, a garlic hot sauce that is mighty fine in many ways. Tammy told me to use it in my Bloody Marys but I am not eager to smell like garlic first thing in the morning (I'm kidding). It was awesome. Tammy did not lead me astray. I made mine the way I usually do, plain tomato juice, worchestershire sauce, a pinch of celery salt, fresh lemon juice, horseradish, a bit of olive juice, vodka (pepper vodka is good) and now, a bit of Rooster Sauce. Tammy puts a meal on a stick in place of the celery and now I am liking that idea a lot. Cheers! I found these darling napkin rings at a store in St. Charles. Bob cooked this lovely dinner for us (nope, the salmon isn't from Missouri!) and I thought it all looked pretty together! 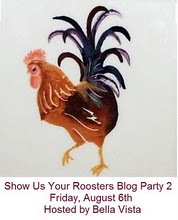 Maybe we blogger friends will have to supply you with a couple of roosters....lol. I love that you got creative with the rooster sauce. Terri, I love your post and I am so glad you joined us, you sweet thing! I will most certainly have to try this but....a bit later. You know me......when I am on something like this Rooster Party, I don't eat for days. Nerves! Yikes. Have fun visiting all the gals. I am seeing hundreds, hundreds of roosters. I have never heard of Rooster Sauce, but it sounds great! I love your napkin rings! You had me at the words, "Bob cooked dinner." Do you rent him out? My son loves this sauce! And yes, there is a rooster on the label! Hey! Yay the food's here! It's not a party without great food! And I'm with Keetha!! Lucky duck with a man that cooks and sooo well! This is perfect - we use Rooster Sauce a lot in our house. My hubby really likes it. I've never heard of rooster sauce, but it sounds good. I missed this year's Rooster Party cuz of my computer snafu! However, I loved seeing what you offered up! Rooster Sauce....it sounds great! :) Yum, so did that dinner BOB COOKED!! I got a chuckle out of the salmon not being from Missouri!! :) Some how grilled carp doesn't' sound as appetizing! :) My husband will soon be taking off for Alaska on a fishing trip. He would live there if I would let him!! I've been there with him a couple of times and it is amazing.....but I couldn't hack their winters. Anyway, back to your salmon.....he's hoping to bring some home as well as some halibut! I hope he does! Thank you for not giving up on me ~ and Living Boldly. You have no idea how often I thought of you over the summer. Your Missouri lives, your struggles, I'm glad I have gotten to know you!